Attending a conference hosted by Ohio State this week, an odd occurrence happened. While sitting down for dinner with the other presenters, I noticed that I had ordered the exact same meal (a Caesar salad and lasagna) as my friend next to me. My friend then noted that he, too, had coincidentally ordered the same thing as the person next to him. And then this person, overhearing our conversation, pointed out that she had unintentionally ordered the same thing as the person next to her! And this restaurant wasn’t even known for their lasagna! Now, coincidence aside, the real question is this: Could ordering the same meal as someone else influence how you perceive that person? Typically, when you go out to eat, it’s a social “no-no” to order the same thing as someone else. Although I have no idea why this was ever a thing, research suggests it should definitely not continue to be a thing. For as studies show, eating the same food as someone else can actually increase your trust in the other person. 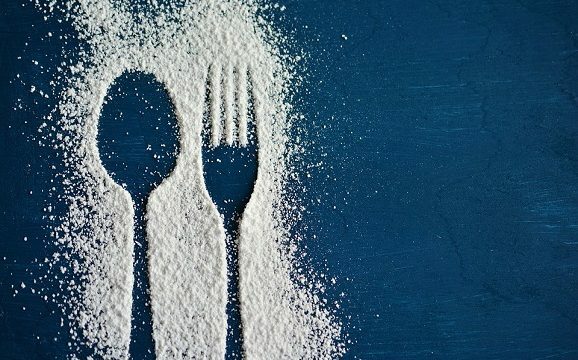 Researchers had two participants (both strangers) come into the lab and had them eat the same foods (e.g., both participants “taste tested” three salty foods) or had them eat different foods (e.g., one participant “taste tested” salty foods while the other tried sweet foods). Afterward, the participants had to engage in a negotiation task. Impressively, the pairs that ate the same snacks (e.g., both ate sweet foods or both ate salty foods) reached a resolution about two times faster than those who ate different foods! Further analyses showed that the partners who at the same food felt socially “closer” to their partner than those who ate different foods. And it was this perceived social closeness that explained how quickly they resolved the negotiation. In another study, participants watched a video of a consumer talking about how much he liked this new “HP software.” Coincidentally, the consumer in the video was snacking on the same food the participant was given to snack on (e.g., grapes). When their snacks matched like this (compared to when they didn’t), participants liked the consumer and trusted their product review more! 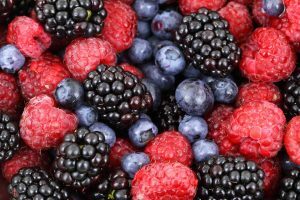 As you know, food plays a very important role in our daily lives, so when we see other people have similar food preferences to ourselves, we are more likely to trust them–and apparently, buy their products, too. 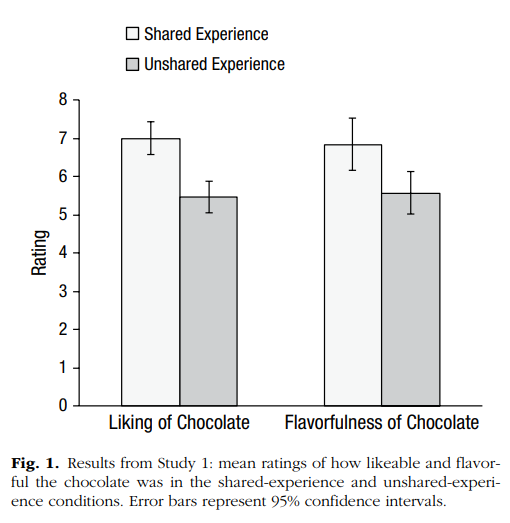 As you can see in the graph above, people who ate the chocolate in with another person (i.e., in the “shared experience), reported liking the chocolate more–even though both pieces of chocolate were from the exact same bar! 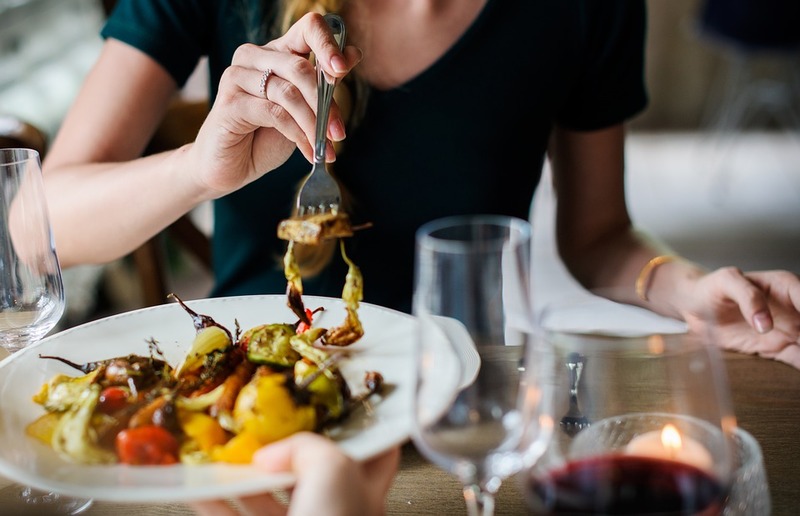 As interesting as it is to see how sharing the same food type with someone else can influence our perceptions of that other person, there is also some interesting research on how eating the same food as someone else can influence our perception of the food itself. In this set of studies, researchers had participants come into the lab to eat two pieces of chocolate. Importantly, the participant ate one piece of chocolate alone, while they at the other piece of chocolate in the same room and at the same time as someone else. Even more importantly, though, unbeknownst to the participant, it was the exact same chocolate in both taste tests. Even still, the participants rated the chocolate tastier when they ate it in the presence of someone else. The researchers suggest that eating the chocolate with others “amplified” the experience of the chocolate. 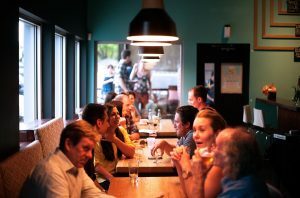 That is, even though the two people didn’t communicate while eating, having another person around could lead one to consider the other person’s thoughts on the experience. In turn, this can you make you feel more absorbed in the experience, increasing the tastiness of the chocolate itself! SHOULD WE ALL EAT THE SAME FOODS? Now, just because the research above suggests some benefits to eating the same thing as those around you, it doesn’t mean you should think these psychological effects will always occur. For example, if the person you’re eating with knows you intentionally copied their meal choice, they may not trust you because they believe you have ulterior motives. Or, if the person you’re eating with turns out to dislike the food you’re both consuming, you may not receive this “amplification” effect on its tastiness. Psch•o•philosophy to Ponder: At the end of this post, I cautioned that there will be conditions under which these effects won’t come about. Can you think of any other times or contexts when they may not work? For example, in both studies, the participants were always paired up with strangers for the taste testing studies. 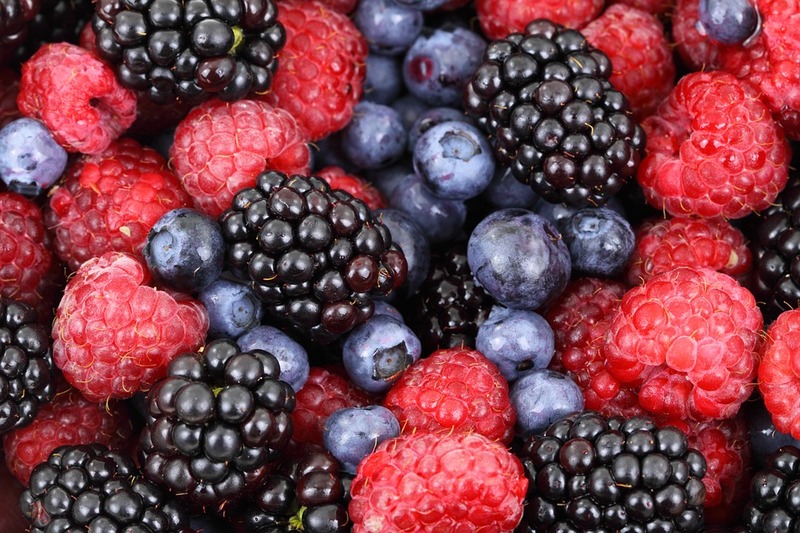 Can you think how things might have differed if they had eaten these foods with friends? Would you really trust your friend more if they ate the same thing as you? Or would you already expect them to have a similar taste profile because they’re you’re friend? What about trying the same food as someone else? Would we expect the effect to hold as well with close others as they showed it with distant ones? Or may it be even stronger? Boothby, E. J., Clark, M. S., & Bargh, J. A. (2014). Shared experiences are amplified. Psychological science, 25(12), 2209-2216. Woolley, K., & Fishbach, A. (2017). A recipe for friendship: similar food consumption promotes trust and cooperation. Journal of Consumer Psychology, 27(1), 1-10. I’m thinking this effect works strongest with strangers. Not as much with close friends. And I’d also have a subconscious belief that this person probably has similar values as me, similar understandings, similar observations and similar decision-making processes. All of that definitely brings us closer, but eventually, as we’d experience more things together, I’d see past my assumptions and realize we aren’t as alike as I thought. But food preferences just seem as trivial as they are at that stage. The areas in which we were mutual were much more important; so, it never seemed like our differences in eating meant a thing. The way I see it, you’re more easily going to make connections with strangers and people you know little of on superficial basis like these. Strangers, each being a mystery, give you a clear canvas to paint your assumptions on. Ones that arise from things as mundane as what they eat. Relationships built on trust from more rational sources don’t feel this food effect. I guess this would apply to people you long-hated as well. Them ordering the same meal as you will unlikely make you elevate your opinion of them. Oh man, those are some seriously GREAT insights. Thank you for taking the time to share them; I truly value and agree with everything you said. As I was reading the paper (and writing up the post), I had a similar intuition to you that this effect would be strongest with strangers. 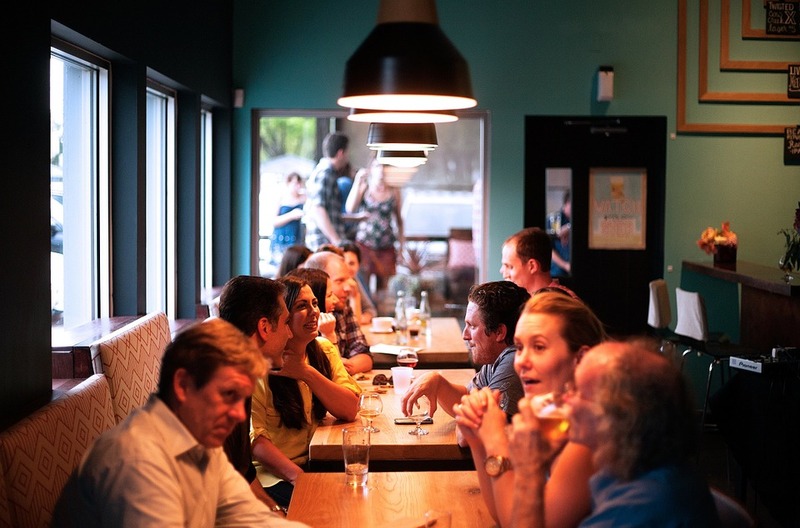 As you suggest, with friends, we have all of these other ways that we connect with them such that if our food preferences differ, it means little because we have all these other points of connection. I also like your thoughts on how this effect may emerge for *disliked* others. It would be really cool to show that we could bring people together simply by getting them to eat the same kinds of food. I think you also raise a really interesting point about how central a person’s food interests are to them and how that could influence the reported effect. For example, with me, I can and will eat just about anything. So if a person matches my preferences, it doesn’t mean much because no single food item/type is that central to how I see myself as an individual (except for maybe PB&J sandwiches, which actually did influence my attraction toward a romantic partner at one point…but that’s a story for a different time). However, for someone like you–for whom only a subset of foods are preferred–finding someone who matches you on those preferences probably indicates a greater similarity across the board. In other words, it seems like “food preference centrality” could be a really cool variable to moderate the effects: for those who don’t have specific preferences, this food-similarity effect probably has little influence even with strangers; however, for those who DO have food-specific preferences, this food-similarity effect is probably even stronger. Keep up the great posts, Jake!